Does Foreign Aid Fuel Palestinian Violence? On December 17, 2007, eighty-seven countries and international organizations met in Paris and pledged to provide $7.4 billion over three years to the Palestinian Authority (PA), an amount far in excess of any previous level of U.S. or European aid to the Palestinians. The conference participants justified the aid as a means of providing "immediate support to the entire Palestinian population," and as a reward intended to strengthen those Palestinians who favor peaceful coexistence with Israel. In the midst of the effort in Paris to bestow unprecedented sums of foreign aid on the Palestinians, there was little discussion of the unintended consequences — often deadly ones — of previous aid regimens. The recent history of foreign assistance shows a distinct correlation between aid and violence. Perhaps aid itself does not cause violence, but there is strong evidence that it contributes to a culture of corruption, government malfeasance, and terrorism that has had lethal consequences for both Israelis and Palestinians over the past decade. The Paris conference aid package continues fifteen years of international funding that has established the Palestinians as one of the world's leading per capita recipients of foreign support (see Table 1). Figures published by the Organization of Economic Cooperation and Development for 2005 show that Palestinians received $304 per person in foreign aid, second only to the war-torn Republic of Congo among entities with populations larger than one million. Unlike the Congo, though, the Palestinians have received such subsidies for decades. Amidst the internal turmoil of 2006 and 2007, aid to the Palestinians increased by more than 50 percent, and in July 2007 the Israeli government handed over $300-400 million in import taxes it had collected on behalf of the PA. This revenue windfall came despite the 2005 warning by George Abed, head of the Palestinian Monetary Authority, that "if you poured in a lot of financing at this time, it would not have a big impact. It would not be very effective … It would be wasted." International organizations and diplomats acknowledge Palestinian misuse and diversion of aid money, but they remain reluctant to study the deeper implications of how such aid affects Palestinian political culture. An examination of key measures of violence reveals a troublesome correlation between the number of homicides committed by Palestinians and the level of funding provided to the Palestinian Authority. As aid to the Palestinian government increased, there was a corresponding increase in the number of people, both Israeli and Palestinian, killed by Palestinians. The correlation between aid and homicide statistics does not mean that foreign aid causes violence, but it does raise a question about whether the flow of aid to the Palestinian government has helped fuel Palestinian violence and hindered efforts to restore calm. 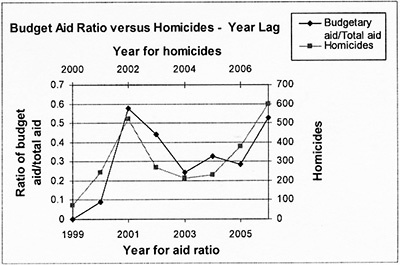 Figures 1 and 2 (see below) illustrate how the number of homicides and level of donor aid correlate. Sources for Figures 1 and 2: Anti-Israeli Terrorism, 2006: Data, Analysis and Trends, Intelligence and Terrorism Information Center, Israel Intelligence Heritage & Commemoration Center (IICC), Gelilot, Mar. 2007, p. 62; The Status of Palestinian Citizens' Rights, fifth through twelfth annual reports, The Palestinian Independent Commission for Citizens' Rights (PICC), Ramallah, West Bank, 1999-2007; Associated Press, Oct. 6, 2005; "Palestinians Killed by Palestinians in the Occupied Territories," B'Tselem, Jerusalem, accessed Feb. 29, 2008; "OCHA-Opt Protection of Civilians," United Nations Office for the Coordination of Humanitarian Affairs, Dec. 2006; "OCHA-Opt Protection of Civilians," United Nations Office for the Coordination of Humanitarian Affairs, Aug. 2007; Reuters, June 8, 2007; Four Years: Intifada, Closures and Palestinian Economic Crisis (Washington, D.C.: World Bank, Oct. 2004), p. 6; "West Bank and Gaza: Fiscal Performance in 2006," International Monetary Fund, Washington, D.C., Mar. 2007, p. 4. The graphs show that increased aid to the PA after the start of the second intifada in September 2000 precipitated an increase in the Palestinian murder rate of both Israelis and Palestinians in 2001 and 2002. After June, 2002, Israeli countermeasures against Palestinian terrorism, such as checkpoints and targeted killings of terrorist leaders, began to reduce the number of Israeli dead. By August 2003, the first portion of Israel's security barrier was in place, leading to a rapid decrease in Israeli fatalities. While Israel's new security measures reduced the number of Israeli victims, factional and societal violence increased the number of Palestinian victims. By counting both Palestinian and Israeli victims, the correlation between increased aid and violence continued into 2007. The correlation between aid and terrorism murders becomes even stronger when the amount of aid given in one year is compared to the number of terrorist murders the following year (Figure 2). 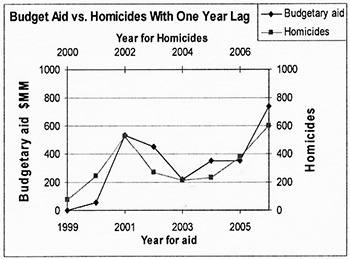 The lag between increased aid and increased homicides suggests a cause and effect association. 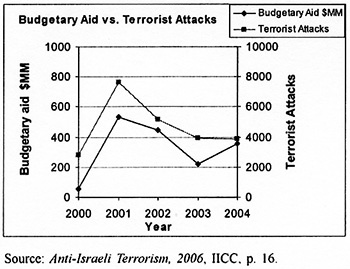 However, when comparing the number of attempted terrorist attacks against Israelis with the level of aid, the correlation is stronger, without introducing any time lag (Figure 3). To investigate the possible linkage between aid and violence, it is useful to examine changes in how foreign aid was distributed during the second intifada. Prior to the outbreak of the second intifada, donors directed nearly all foreign aid to the Palestinians to economic and infrastructure development programs, so that by 1999 the Palestinian Authority could raise enough revenue through taxation and private borrowing to pay its bills. This era of relative self-sufficiency would not last long, however. The Palestinian terror campaign launched against Israel in 2000 disrupted the three main PA revenue sources — clearance taxes collected by Israel, taxes on wages earned by Palestinians working in Israel, and domestic tax revenue. Israel Defense Forces (IDF) measures against terrorists interfered with commerce in the West Bank and Gaza and led to a 40 percent decline in domestic tax revenues between 1999 and 2002. At the same time, the Israeli government curtailed the number of Palestinians working within its borders, reducing a lucrative source of tax revenue for the PA. The Israeli government also decided to withhold tax receipts it collected for the PA in response to the failure of Palestinian leaders to make a serious effort to halt terrorism. The international community responded to the ensuing Palestinian financial crisis by replacing much of the lost revenue. Foreign donations to the Palestinians nearly doubled, from $482 million in 2000 to $929 million in 2001. The changes in how the aid was distributed were even more dramatic: In 1999, no foreign aid went directly into the Palestinian Authority budget; by 2001, 58 percent of it went to the government budget and less than 20 percent to development programs. In a classic example of the creation of perverse incentives, the decision to fund the government budget made the Palestinian Authority less dependent on revenue derived from commerce, detaching the PA's solvency from the health of the economy. Thus, while the intifada sent the Palestinian economy into free fall, the PA's coffers swelled. The conditions were thus established that ensured the separation of Palestinian governance from responsibility for the economic health of the Palestinian people. Sources for Figures 4 and 5: "Two Years after London: Restarting Palestinian Economic Recovery," Ad-hoc Liaison Committee, World Bank, London, Sept. 24, 2007, p. 29, Table 3; Four Years: Intifada, Closures and Palestinian Economic Crisis (Washington, D.C.: World Bank, Oct. 2004), p. 66, Table 5.3. By 2003, the ratio began to shift so that aid was more evenly distributed between the PA budget and development programs. However, the proportion of aid allocated to the government began to rise again in 2005, so that by January 2008, Palestinian economist Samir Barghouthi estimated that the Paris conference aid package would commit 70 percent of donations to paying the wages and pensions of Palestinian employees. In other words, a higher proportion of aid will be allocated to the government and a lower proportion to development programs than even at the height of the terrorist violence of the intifada. The new flow of funding to the Palestinian government will likely replicate the dynamics of the past decade: In 1999, the PA had 98,500 on its payroll; by 2002, the payroll had grown to nearly 125,000, and by 2007, it stood at 168,319. Rising Palestinian government employment was reflected in the proportionate growth of the security services, which accounted for nearly half of all government wage earners. Security personnel on the PA payroll grew from 44,400 in 1999, to 53,600 in 2002, to 78,000 in mid-2006. In addition, the Jordanian foreign ministry has confirmed plans to increase the Palestinian police force in the West Bank from 7,000 to 50,000 men, an increase that will create an unprecedented police presence and require an investment of several billion dollars beyond what was promised at the Paris conference. These dramatic increases in the number of security personnel have never resulted in a reduction in terror attacks against Israelis—and as the history of the intifada shows, such attacks in fact increased from 1999 to 2002. Not only did the security forces fail to prevent terrorist attacks, in many cases they colluded with terrorist groups and sometimes perpetrated attacks themselves. For example, on January 30, 2004, a Palestinian policeman belonging to the Al-Aqsa Martyrs' Brigades boarded a crowded bus in Jerusalem and detonated a bomb strapped to his body, killing ten Israelis. The Palestinians responded that they could not prevent terrorism because the Israeli military had destroyed their capacity to do so. In A Police Force without a State, Brynjar Lia, a Norwegian Defense Research Establishment analyst, suggests that the Palestinian leadership gave preference in police recruitment to those who had served prison terms in Israeli jails for terror-related offenses. This, he argues, allowed terrorists to shape the police force "as a vehicle for achieving national independence [rather] than as a non-political law and order agency." Fatah paramilitaries, he contends, "made themselves indispensable as popular forces in anti-Israeli riots and clashes." Lia offers a plausible path by which foreign aid ended up in the hands of terrorists. As early as 2003, the World Bank recognized there was a problem with how aid was used, noting in its annual report on the West Bank and Gaza that "donors should have spent more on oversight mechanisms in 2001 and early 2002, thereby, putting themselves in a better position to answer questions about the diversion of funds to support terrorism." Still, the World Bank justified the redirection of funds for emergency aid in the belief that donors "had no choice if they wanted to keep alive the hope of reconciliation, since a collapse of the PA service structure and the further radical impoverishment of the population would have vitiated this." The Israeli government and military watched the diversion of funds but could not change donor practices. On June 5, 2002, the IDF published a document calculating that the Palestinian Authority only needed 55 to 65 percent of its budget to fund legitimate government activities and estimated that the Palestinian Authority siphoned off $100 million a year to fund terrorism. The estimates of need versus budget are consistent with more recent news accounts. Documents captured during Operation Defensive Shield in 2002 detail security forces involvement in terrorist operations. An Israeli document describing the interrogation of Fatah leader Nasser Aweis in 2002 revealed the links between Tanzim operatives and the PA national security apparatus and showed not only how Palestinian security officers instructed Tanzim operatives in bomb-making, but also how they regularly updated Palestinian Authority leader Yasser Arafat. Other documents detailed Palestinian Authority salary payments to terrorists in the employ of security service officials. The correlation between donor aid and violence becomes murky when examining the affiliations of the terrorists. Palestinian terrorism is conducted by a variety of organizations, many of which derive their support from foreign sources separate from Western government aid. Islamist groups such as Hamas and Islamic Jihad, which have carried out the majority of attacks against Israel, have had an uneasy and frequently adversarial relationship with Fatah-dominated Palestinian governments. Groups directly linked to Fatah, such as Al-Aqsa Martyrs' Brigades and Tanzim, account for only about 20 percent of the suicide bombings against Israel. Suicide bombings have been responsible for more than half of all Israeli fatalities since 2000. These circumstances make it difficult to understand why the correlation between aid to the Palestinians and terror homicides appears so strong. The organizational affiliations of terrorists, however, may be multiple. Despite their strong internal differences, Fatah and the Islamists enjoy a high degree of cooperation in terrorism against Israel. The Palestinian Authority's Preventive Security Apparatus, for example, supported both Hamas and Islamic Jihad in Jenin. Fatah's Al-Aqsa Martyrs' Brigades and one or the other Islamist groups have carried out a number of joint operations. These collaborative relationships continue. There remains ongoing concern that donor funds given to Palestinian Authority leader Mahmoud Abbas are subsidizing Hamas members on government ministry payrolls. And then there is the larger problem of the fungibility of money: Every dollar Hamas saves on having to fund jobs and programs unrelated to security is a dollar the organization can devote to terrorism. While collusion is clear, fully explaining the correlation requires better data on funds supplied covertly by Iran and sources within Saudi Arabia and better understanding of the role of tacit support from the Palestinian security services. Perhaps U.S. and European officials still believe that supporting those suffering from the Palestinians' damaged economy outweighs the negative effect of the diversion of funds to terrorists. While international officials often say they seek to promote a more moderate political culture among Palestinians, the Hamas victory in the January 2006 elections suggests such hope may be misplaced. At the time, the Palestinian economy had begun to improve. Similarly, in 1998 and 1999, the two years immediately preceding the second intifada Palestinian gross domestic product increased by 7 and 6 percent respectively. Perhaps the bitterness of conflict outweighed the moderating influence of the aid—or, perhaps, the theory that aid moderates is itself flawed. What Changed between 2000 and 2007? The aid windfall comes amid the PA's refusal to take responsibility for Palestinian rocket fire on Israeli towns. In 2006 and 2007, 1,719 rockets launched from Gaza hit Israeli territory. On January 3, 2008, an upgraded 122 mm rocket fired from Gaza reached the major Israeli city of Ashkelon. Nor has any Palestinian leader repudiated terrorism. Attacks by Fatah continue. While the security barrier has curtailed terrorist attacks, the terrorist groups have not stopped trying. Yet even some prominent Palestinians are troubled by the current determination to fund the Palestinian Authority. Abed of the Palestinian Monetary Authority, although supportive of financial assistance to the Palestinians, has spoken openly of the futility of providing donor aid, asserting that what is needed is investment. This view was echoed by James Prince, consultant to the Palestinian Investment Fund, who cautioned that "many of the donor programs have not only been ineffective, they have harmed the economy." Infusions of foreign funds into the Palestinian Authority budget from late 2000 through 2002 correlated with increased violence. Increased aid in 2005 and 2006 corresponded to increasing internal violence, which is consistent with the fact that money was still finding its way to militant groups to purchase weapons and pay the salaries of the expanding militias. 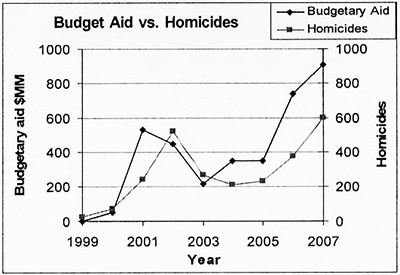 Although the correlation does not prove cause and effect or provide irrefutable evidence of a direct link, it seems likely that increased aid helps sustain Palestinian violence in several ways: by creating the opportunity to divert funds for militant activities; by insulating the Palestinian leadership from the fiscal consequences of the economic fallout from terrorism; and by creating a revenue surplus that allows the Palestinian government both to pay for salaries and programs and to funnel money to terrorists. As Western donors prepare to pour unprecedented amounts of money into the PA, more discussion is needed to explain what controls will be imposed to ensure that the aid is not diverted to terrorists or used to fund a broader conflict with Israel. Steven Stotsky is a senior research analyst at the Committee for Accuracy in Middle East Reporting in America (CAMERA). The New York Times, Dec. 18, 2007. Nicolas Sarkozy, president of France, speech to International Donors' Conference for the Palestinian State, France Diplomatie, French Ministry of Foreign and European Affairs, Dec. 17, 2007. Condoleezza Rice, U.S. secretary of state, remarks at the International Donors' Conference for the Palestinian State, U.S. Department of State, Dec. 17, 2007. Calculations from World Bank Development Indicators Data Base, 2005 and Recipient Aid Charts, Development Cooperation Directorate, Organisation for Economic Co-operation and Development (OECD), Jan 1, 2006. USA Today, Dec. 17, 2007; The Washington Post, Oct. 31, 2007; International Middle East Media Center (West Bank and Gaza), Dec. 15, 2007. The San Francisco Chronicle, Sept. 4, 2005. West Bank and Gaza: Economic Performance and Reforms under Conflict Conditions (Washington, D.C.: International Monetary Fund [IMF], Sept. 2003), pp. 87-98. Anti-Israeli Terrorism, 2006: Data, Analysis and Trends, Intelligence and Terrorism Information Center, Israel Intelligence Heritage and Commemoration Center (IICC), Gelilot, Mar. 2007, p. 62; The Status of Palestinian Citizens' Rights, 5th through 12th annual reports, The Palestinian Independent Commission for Citizens' Rights (PICC), Ramallah, West Bank, 1999-2007; Associated Press, Oct. 6, 2005; "Palestinians Killed by Palestinians in the Occupied Territories," B'Tselem, Jerusalem, accessed Feb. 29, 2008; "OCHA-Opt Protection of Civilians," United Nations Office for the Coordination of Humanitarian Affairs, Dec. 2006; "OCHA-Opt Protection of Civilians," United Nations Office for the Coordination of Humanitarian Affairs, Aug. 2007; Reuters, June 8, 2007. Four Years: Intifada, Closures and Palestinian Economic Crisis (Washington, D.C.: World Bank, Oct. 2004), p. 6; "West Bank and Gaza: Fiscal Performance in 2006," International Monetary Fund, Washington, D.C., Mar. 2007, p. 4. Anti-Israeli Terrorism, 2006, IICC, p. 16. West Bank and Gaza: Economic Performance and Reforms, IMF, p. 71; Four Years: Intifada, World Bank, p. 20. West Bank and Gaza: Economic Performance and Reforms, IMF, pp. 34, 71. Four Years: Intifada, World Bank, p. 66. The Christian Science Monitor, Jan. 4, 2008. West Bank and Gaza: Economic Performance and Reforms, IMF, p. 92; "Two Years after London: Restarting the Palestinian Economic Recovery," World Bank, London, Sept. 24, 2007, p. 10; "West Bank and Gaza Update," World Bank Group, Gaza and West Bank Office, Mar. 2007, p. 10. West Bank and Gaza: Economic Performance and Reforms, IMF, p. 92; author's calculation from data in West Bank and Gaza: Recent Fiscal and Financial Developments, IMF, Washington, D.C., Oct. 2006, p. 7, ftnt. 8, p. 10, Table 3; James D. Wolfensohn, Quartet special envoy for disengagement, testimony to the Foreign Relations Committee, U.S. Senate, Mar. 15, 2006, p. 3. Reuters, Feb. 9, 2008; The Jordan Times (Amman), Feb. 27, 2008. CNN News, Jan. 30, 2004. Saeb Erekat, interview, CNN, Sept. 19, 2002. Brynjar Lia, A Police Force without a State: A History of the Palestinian Security Forces in the West Bank and Gaza (Reading, U.K.: Ithaca Press, 2006), p. 137. Twenty-Seven Months, Intifada, Closure and Palestinian Economic Crisis (Washington, D.C.: World Bank, May. 2003), p. 88. "International Financial Aid to the Palestinian Authority Redirected to Terrorist Elements," Israel Defense Forces Military Intelligence, Israel Ministry of Foreign Affairs (MFA), June 5, 2002; Rachel Ehrenfeld, "Eurocash," National Review Online, Dec. 10, 2003. "The Involvement of Arafat, PA Senior Officials and Apparatuses in Terrorism against Israel," Israel Ministry of Foreign Affairs, May 6, 2002. "Senior Fatah Leaders Describe Arafat's Link to Terrorism," Israel Ministry of Foreign Affairs, May 2, 2002. "Palestinian Authority Security Services Supplied Guidance, Weapons and Funds to Al-Aqsa Martyrs' Brigades in Order to Perpetrate Terrorist Attacks," Embassy of Israel, Washington, D.C., Israel Ministry of Foreign Affairs, May 2002. Rachel Ehrenfeld and Sarah Zebaida, "EU and the PA Money Trail," National Review Online, Jan. 27, 2003; Jonathan D. Halevi, "What Drives Saudi Arabia to Persist in Terrorist Financing," Jerusalem Viewpoints, Jerusalem Center for Public Affairs, Jerusalem, June 1, 2005. "Suicide and Other Bombing Attacks since the Declaration of Principles (Sept. 1993)," Israel Ministry of Foreign Affairs, accessed Feb. 13, 2008. "The Involvement of Arafat," MFA, May 6, 2002. "Palestinian Authority Security Services," MFA, May 2002. "Documents Seized during Operation Defensive Shield Linking Yasser Arafat to Terrorist Activities," doc. no. 6, Israel Ministry of Foreign Affairs, Apr. 15, 2002, accessed Feb. 13, 2008; The New York Times, Jan. 14, 2005; "Suicide and Other Bombing Attacks in Israel," MFA, accessed Feb. 13, 2008. Four Years: Intifada, World Bank, p. 20; "Report No. 23820," An Evaluation of Bank Assistance, World Bank, Washington D.C., Mar. 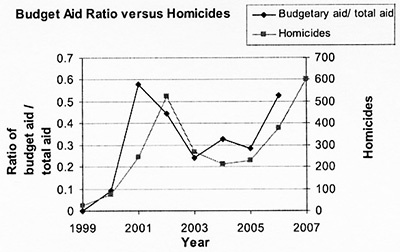 7, 2002, p. 2, Table 1.1. Claude Berrebi, "Evidence about the Link between Education, Poverty and Terrorism among Palestinians," Peace Economics, Peace Science, and Public Policy, Rand Corporation, Jan. 2007; Alan B. Krueger and Jitka Maleckova, "Education, Poverty and Terrorism: Is There a Causal Connection," Journal of Economic Perspectives, Fall 2003; Jean Paul Azam and Alexandra Delacroix, "Aid and the Delegated Fight against Terrorism," Review of Development Economics, May 2006, pp. 330-44. Associated Press, Nov. 24, 2007. USA Today, June 19, 2007. The Jerusalem Post, Feb. 27, 2008. "Rocket Threat from Gaza," Israel Ministry of Foreign Affairs, Dec. 16, 2007. "Katyusha Rocket Fired at Ashkelon," Israel Ministry of Foreign Affairs, Jan. 3, 2008. The Jerusalem Post, Jan. 1, 2008. The San Francisco Chronicle, Sept. 5, 2005. Related Topics: Arab-Israel conflict & diplomacy, Palestinians | Steven Stotsky | Summer 2008 MEQ receive the latest by email: subscribe to the free mef mailing list This text may be reposted or forwarded so long as it is presented as an integral whole with complete and accurate information provided about its author, date, place of publication, and original URL.